Several years ago I purchased a copy of N.T. 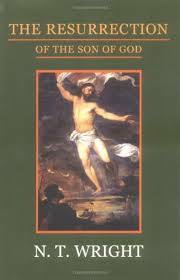 Wright’s massive book, The Resurrection of the Son of God. It’s a thorough investigation of the historical validity of Jesus’ resurrection. This Easter, I reviewed the opening chapters of the book and was struck again by one of the main ideas. Wright shows that in Jesus’ day virtually no one thought resurrection was possible (by “resurrection” we mean return to physical life in transformed body after physical death). Following the thinking of Homer and Plato, Gentiles thought resurrection was a ludicrous idea, both unthinkable and undesirable. Some Jews (i.e. Pharisees) believed in a physical resurrection, but only at the end of history. So Jesus’ resurrection caught everyone by surprise. The people in Jesus’ day (both Jews and Gentiles) didn’t have a category for someone rising physically from the dead in the middle of history. Here’s the big point Wright makes: Believing in the resurrection of Jesus required a major shift in worldviews for both Jews and Gentiles. And since worldviews normally change gradually, not suddenly, we are forced to explain the sudden shift. How could so many people change their worldview about resurrection so quickly? How could the early church grow rapidly in a cultural context where its central message (the gospel of a resurrected Christ) ran counter to current thinking? Wright’s conclusion: only the actual resurrection of Jesus could account for such a change. Any other explanation doesn’t fit the facts. After completing his book, Wright gave it to a philosophy tutor (i.e. professor) at Oxford to read. The tutor told Wright he had done a great job making a sound argument for the resurrection. But he went on to say that he was still choosing to believe there must be some other explanation, even though he didn’t know what it was. Easter requires faith from each of us. It takes faith to believe in the resurrection. But given the overwhelming evidence of both Scripture and history, it also takes faith not to believe.